Ignimbrite is a sedimentary rock formed in a sub-aerial environment by explosive volcanic activity. Pyroclastic flows deposit ignimbrite on land surfaces following a volcanic event that releases large amounts of hot rock fragments into the atmosphere. A pyroclastic flow can occur when magma mixes with water causing a steam explosion, when gas-rich magma bursts through a confining covering of rock or when rocks surrounding a volcanic crater collapse into the crater. In each case a high-velocity stream of air mixed with incandescent rock fragments can flow downward away from the volcanic source and deposit rock and volcanic ash over land areas at considerable distance from the initial explosion. These rock and ash deposits comprise ignimbrite. 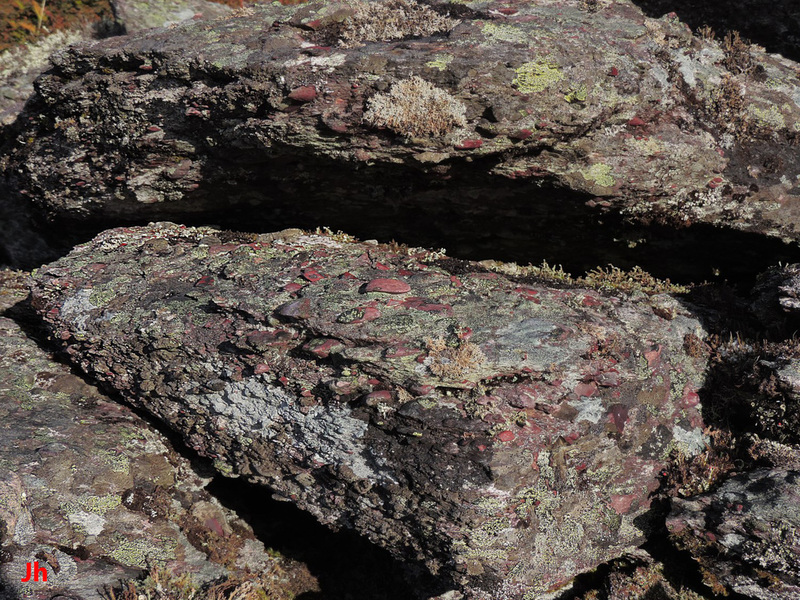 Ignimbrite is found in several areas of Heart of Avalonia. 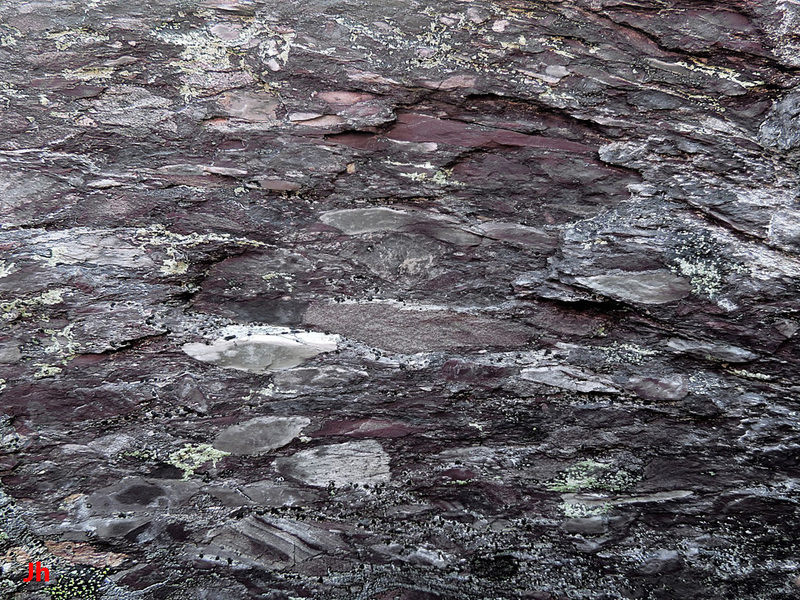 Unlike most ignimbrite deposits found worldwide, all of the ignimbrite in Heart of Avalonia is of Precambrian age and accordingly is subject to changes in its texture and composition following the effects of metamorphism and metasomatism. Eutaxitic ignimbrite is a layered variety of ignimbrite formed as a result of rheomorphic flow. Rheomorphic flow occurs when a large volume of hot ignimbrite builds up on a surface and then compacts itself under its own weight. The lower layers of accumulation, softened by elevated temperature, can be squeezed out from beneath the layers above. Hot ignimbrite is not a liquid, and rheomorphic flow has more the character of the deformation of a plastic solid than the flow of a viscous liquid. Shear strain accompanying rheomorphic flow will deform rock fragments in the ignimbrite and impart a layering or cleavage in the resultant rock that might be confused with tectonic cleavage. The main difference between eutaxitic ignimbrite and ignimbrite modified by regional metamorphism, aside from the time of deformation (perhaps millions of years later for the metamorphosed material), is that clasts present in eutaxitic ignimbrite were soft enough when stressed to deform into flattened shapes. Deposits of eutaxitic ignimbrite are not widespread in Heart of Avalonia, but are interesting in the context of the regional metamorphism that subsequently affected them. 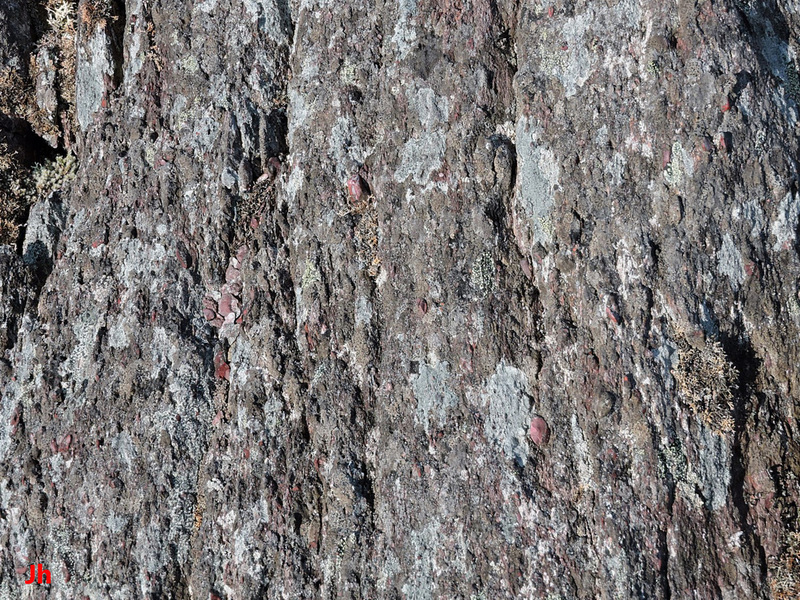 This photo (width of view 30 cm) shows a detail of an exposed vertical rock face comprised of eutaxitic ignimbrite. The rock fragments (clasts) embedded in the ignimbrite have been flattened and elongated by rheomorphic flow. Cleavage is evident in the plane parallel to the flat, broadened surfaces of the clasts. This cleavage has survived since the eutaxitic ignimbrite was formed. The plane of the rock surface facing the camera is also a cleavage plane. However this cleavage originated from tectonic compressional stress occurring millions of years later and at right angles to the original gravitational stress that flattened the clasts. The rock sample shown on the left (width of specimen 18 cm) is a combination of tuff and eutaxitic ignimbrite. 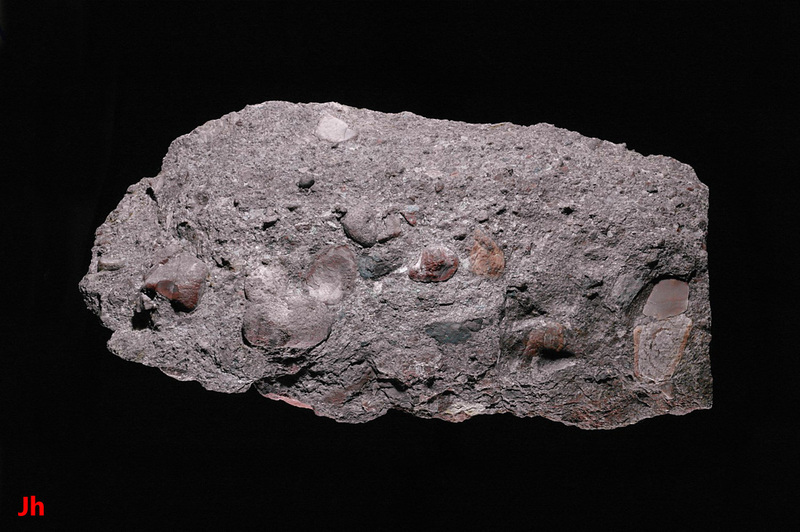 The prominent oval-shaped clast is a fiamme (Italian for flame) and shows the end result when a heat-softened rock fragment is strongly deformed by rheomorphic flow. The gravitational stress was acting in the vertical direction shown on the photo. Clasts shaped like the fiamme shown above are useful in identifying eutaxitic ignimbrite. 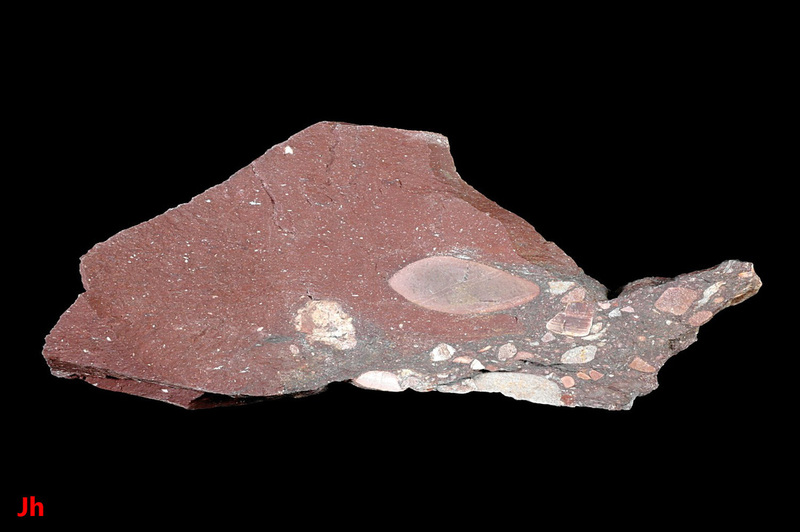 The surface of the specimen facing the camera is a cleavage surface resulting from tectonic compressional stress. The sample of rock shown on the right (width of specimen 30 cm, thickness 2 cm) is a slab of eutaxitic ignimbrite with strong cleavage parallel to the flattened clasts. The plane of cleavage faces the camera. 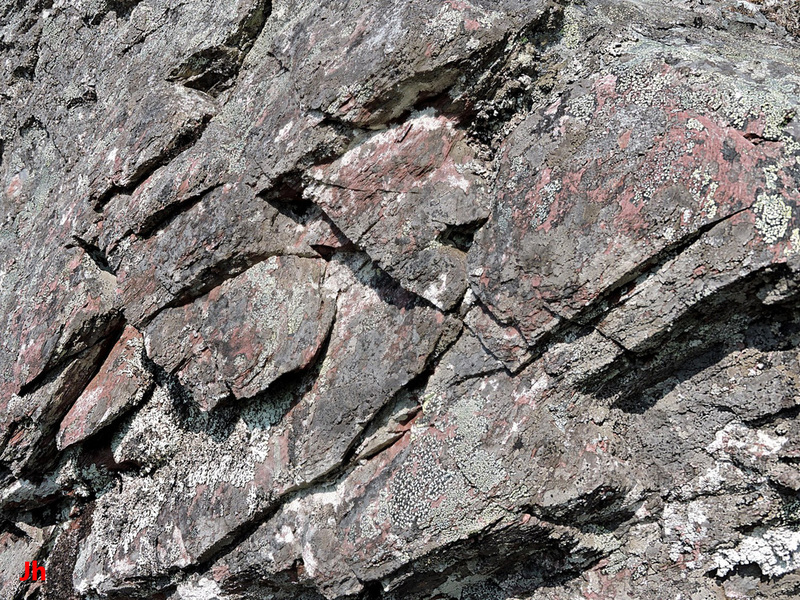 This cleavage is a remnant from the formation of the rock and has not been overprinted by tectonic cleavage. 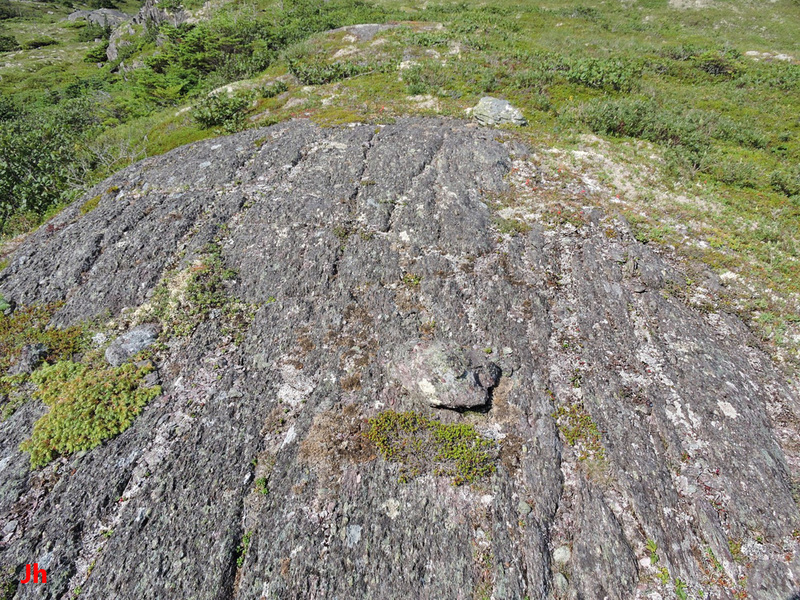 The ridge shown above is composed entirely of eutaxatic ignimbrite. In most places on the ridge, however, the ignimbrite cleavage has been overprinted and the remaining cleavage is tectonic in origin. 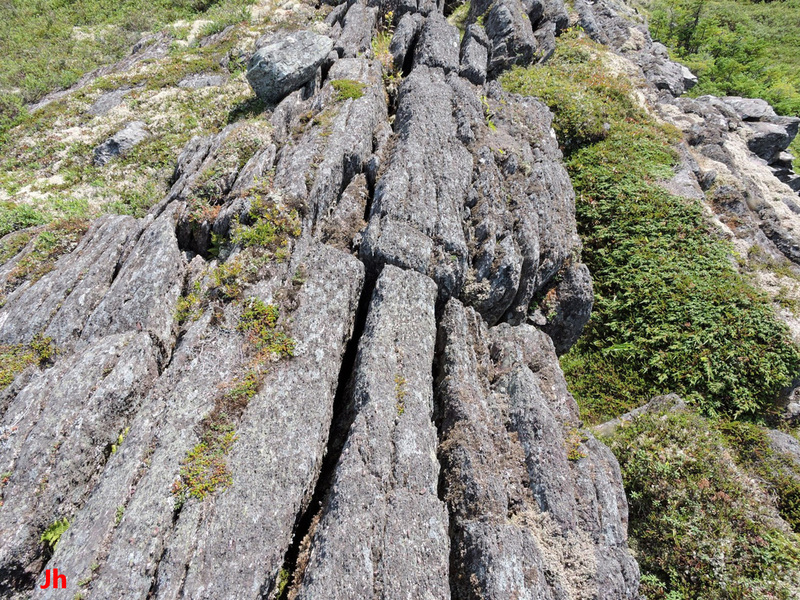 The rock exposed on the irregular rock face seen center, right on the photo shows strong longitudinal tectonic cleavage and cross jointing. 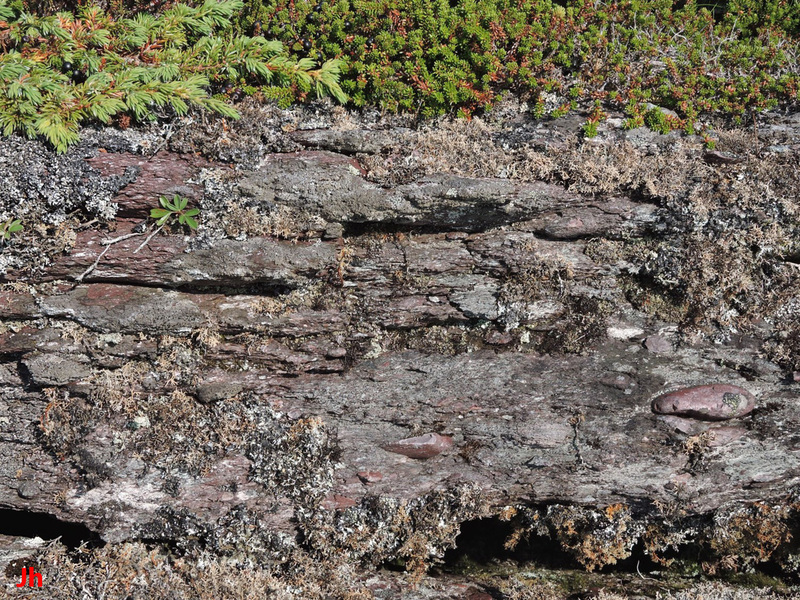 The more severely frost-weathered rock at the left of the photo possesses longitudinal tectonic cleavage, along with areas of distinct original cleavage from the deposition of the ignimbrite. Closeups of the eutaxitic ignimbrite texture in the left-hand rocks are shown below. All three of the pictures above show views about 1 m wide. The ignimbrite boulder seen in the top picture has separated top and bottom from the host rock along original depositional cleavage planes. The red clasts have been flattened by rheomorphic flow. A side-on view of eutaxitic ignimbrite cleavage planes is shown left, bottom, while the photo right, bottom shows a view looking down at a plane of cleavage from above. 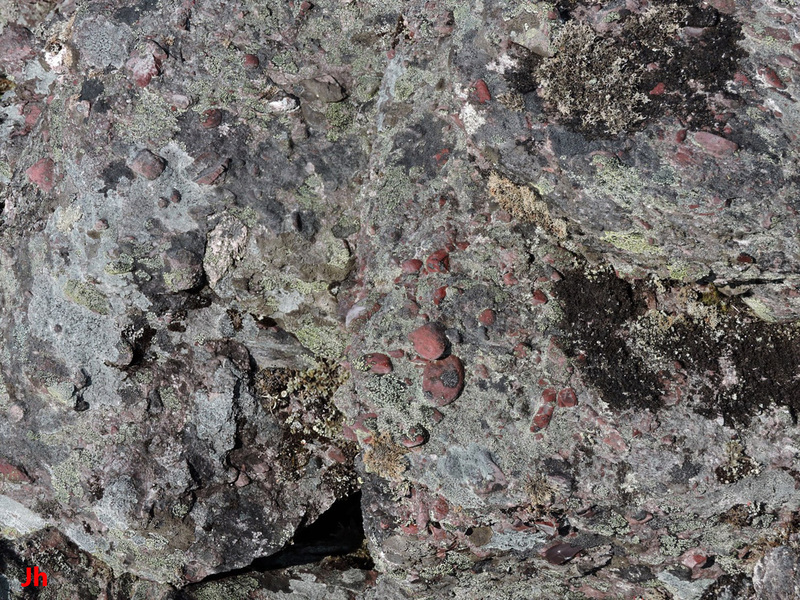 The flat red clasts seen near the center of the picture are not loose, but are embedded in the ignimbrite. These pictures illustrate complex patterns of joints and cleavage surfaces in eutaxitic ignimbrite and/or tuff which has undergone rheomorphic flow. Both views span about 75 cm. Flattened clasts in the rock indicate the cleavage planes associated with ignimbrite formation. These cleavage planes are the top planes in both pictures. The other joint sets present in the rock are longitudinal and cross joints of tectonic origin. Each of the pictures above depicts eutaxitic ignimbrite where the original cleavage associated with deposition and rheomorphic flow has been completely overprinted with tectonic cleavage. The top photo shows evidence of flattened clasts, seen on the surface. These clasts were oriented perpendicular to the direction of gravitational stress at the time the ignimbrite was formed, and their orientation has not changed significantly up until the present time. 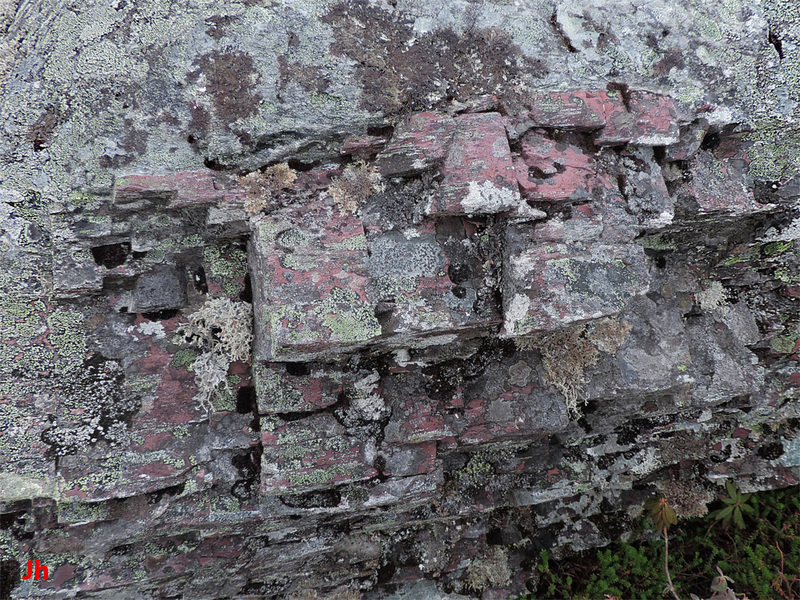 However, the cleavage planes in the rock, as evidenced by the erosion-etched surface, are now oriented vertically. Similarly, the two bottom photos show outcrops of eutaxitic ignimbrite with tectonic cleavage planes and associated jointing at right angles to the plane of flattening of the embedded clasts. The realignment of the original ignimbrite cleavage by regional metamorphism indicates the presence of phyllosilicate minerals in the ignimbrite. There is further discussion of this under the heading "Rocks" in the section Planes of Weakness: Serrated Hill.